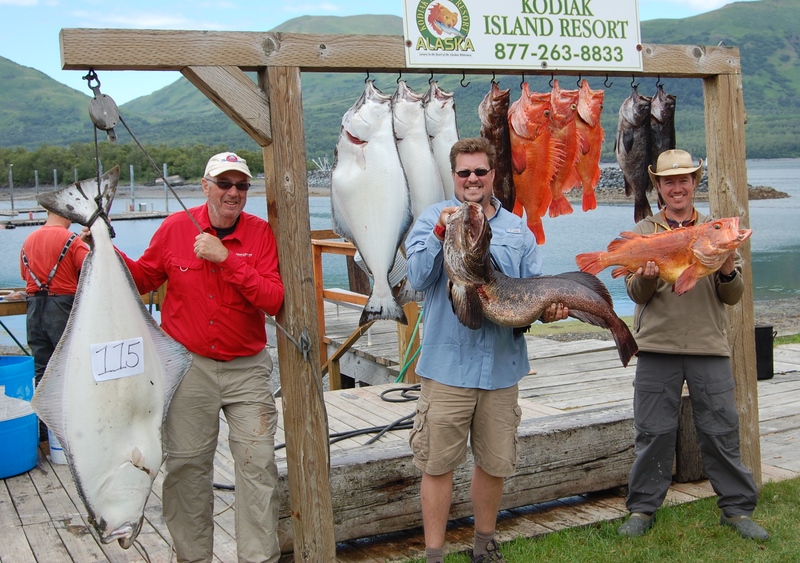 By Kodiak Resort July 19, 2014 Comments Off on Minnesota Family Scores Reef Fish Grand Slam! Jim Thibodeau and sons Troy and Chad from Minneapolis just completed another visit to Alaska’s Kodiak Island Resort with great flair. The guys enjoyed everything we have to offer including a killer whale show, seeing a mama brown bear and two cubs, digging limit of razor clams, catching another limit of tanner crabs and capping off their visit with an Alaska reef fish grand slam on their last day. Jim lead the way with a 115 pound halibut and 40 pound ling cod and they each caught a 20 pound yelloweye rockfish in addition to limits of halibut and black rockfish. This was their second visit to our lodge and they vow to fish with our charter business in Naples, FL this winter. This is a great family and the type which makes our job so great. They enjoyed everything we offered and we enjoyed equally showing them everything we could in our special area.